With 2 billion more people inhabiting the earth in the next 40 years, food production must increase. Some countries, such as Switzerland, have adopted policies to encourage farmers to not use pesticides. The non-use of pesticides is slowing down increased food production. Policymakers need to be aware of these consequences. “We analyze trends in crop yields and yield variability of barley, maize, oats, rye, triticale and wheat in Switzerland from 1961 to 2006. It shows that there have been linear increases in crop yields since the 1960s. However, yields of barley, oats, rye, triticale and wheat have leveled off in Switzerland since the early 1990s, which contrasts linear trends in cereal yields that is usually assumed for Europe. We show a relationship between the introduction of agricultural policy measures towards environmentally friendly cereal production that fostered widespread adoption of extensive farming practices and the observed leveling-off of crop yields. Thus, this paper emphasizes that agricultural policy can be an important reason for slowing crop yield growth. Recent declines and leveling-off of yields are attributed to the adoption of an environmental program that aims to reduce the environmental load of agriculture as well as to decreasing crop prices. In Switzerland, agricultural policy reforms in 1992 introduced ecological direct payments for extensive cereal production and led to major changes in production patterns… In this ancillary payment scheme no application of fungicides, plant growth regulators, insecticides and chemical-synthetic stimulators of natural resistance is allowed. …the share of the cereal production area under this ecological direct payment scheme to the total area under cereals (except maize) was 37% in 1992, increased to 54% in 1997, but remained stable at about 50% since then. The adoption of extensive cereal production in the framework of ecological direct payments leads to crop yield reductions in different ways: crop yields in extensive farming systems are smaller than for intensive management, simply due to the non-use of agro-chemicals. Affiliation: Agri-food and Agri-environmental Economics Group, Zurich, Switzerland. 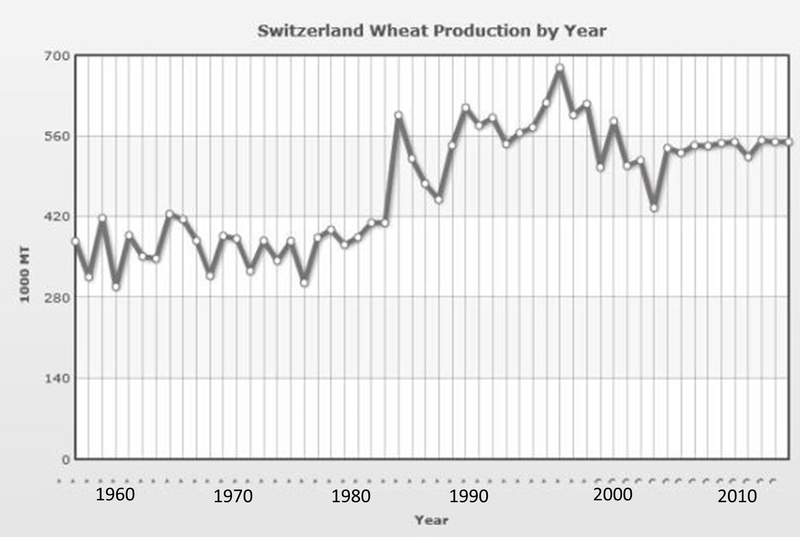 Title: Evidence of slowing yield growth – the example of Swiss cereal yields. Source: Food Policy. 2010. 35:175-182. This entry was posted in Pesticides and tagged barley, crop yields, food production, oats, pesticides, rye, Switzerland by pesticide guy. Bookmark the permalink.